Daniel and Geoff, united in their dedication to scoreboard accuracy. 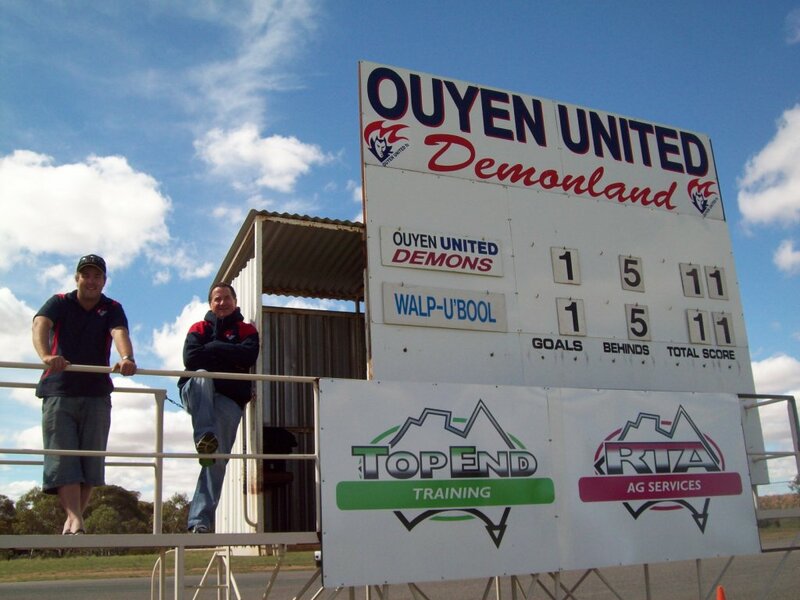 Ouyen United Football and Netball Club competes in the Mallee Football and Netball League in north-western Victoria. The Demons’ rather unique scoreboard at the Blackburn Park ground is a former testing stand for the Grain Elevators Board and has been in operation for the last 20 years. Dozens of these testing stands are to be found in the Mallee region, usually adjacent to grain silos. The scoreboard is operated by local personality Geoff Amos and his able assistant Daniel Floyd. Daniel is a mental arithmetic whizz-kid and a senior mathematics graduate from Ouyen Secondary College. The duo have been in charge of the scoreboard for the last nine years for all home games and finals – which makes a very long day with the Under 16s, reserves and senior teams. The minis (Under 13s), who play at half time of the senior game, do not require the scores to be recorded. The scoreboard has single hooks for each number and is easy to operate. Geoff and Daniel do not get paid for their services but receive a liquid refreshment after the game and a free membership of the club (value $80). They nominate the key features of the scoreboard as the air conditioning in the winter and the heating in the summer. 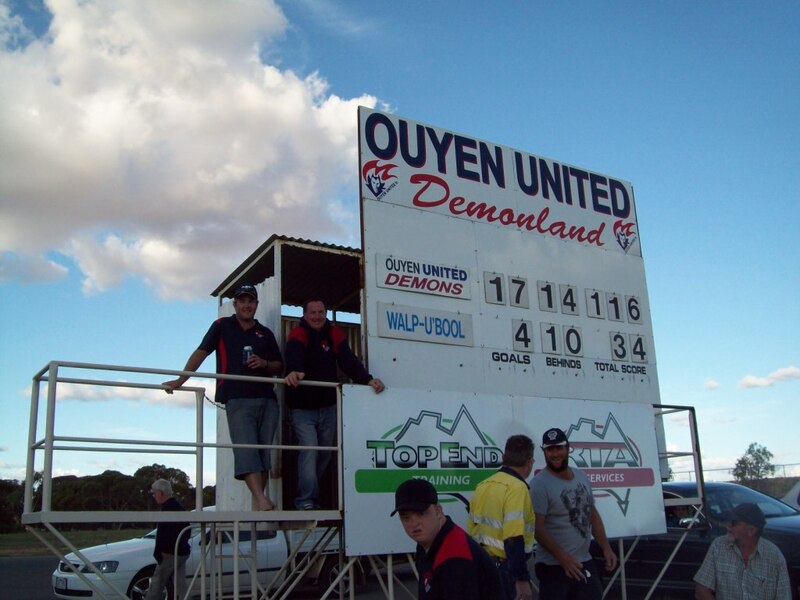 The most exciting game they have scored was when Ouyen United beat Walpeup-Underbool by one point in 2009, a celebration game for the 100th anniversary of the Ouyen township. Other highlights include doing a couple of Grand Finals and a couple of Preliminary Finals. The finals venues are rotated among the seven clubs of the Mallee league and must be played on neutral grounds for the teams in the senior game. The other teams in the league are Walpeup-Underbool, Sea Lake- Nandaly Tigers, Woomelang Lascelles, Hopetoun, Beulah and Jeparit-Rainbow. Geoff doesn’t drink alcohol during the game because it is a long way to go to the nearest toilet, in the change rooms on the other side of the ground. He has however sometimes relented during the pressure of a close game. Geoff added that his assistant has a small esky which can hold several cold cans. Geoff and Daniel take pride in their scoreboard work and have yet to make a mistake in nine years. They are widely known as the best scoreboard operators in the Mallee Football League. They were once approached by a rival club to man its scoreboard. A big win, and the end of a long day for the masters of the Mallee. Match report and action photos. Junior footy and netball photos. 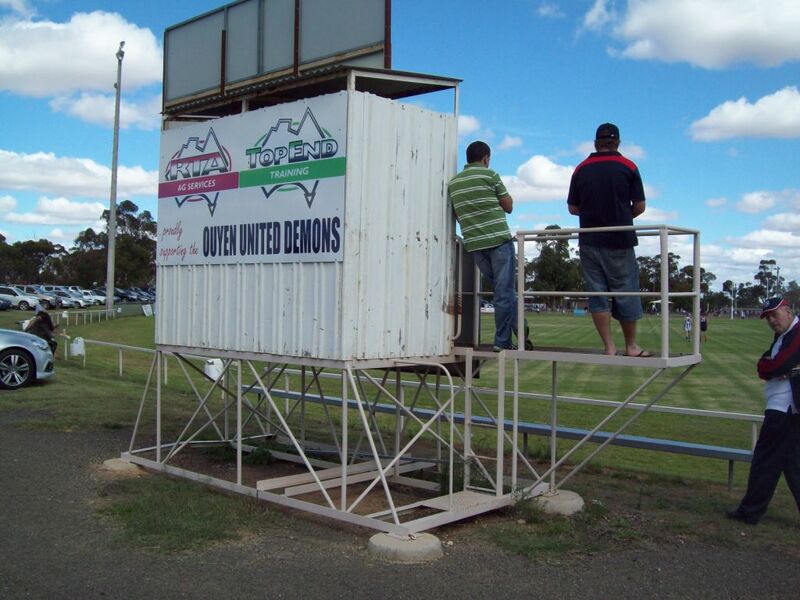 Geoff van Wyngaarden, a former teacher at Ouyen Secondary College and former timekeeper at Ouyen United, operated the Williamstown scoreboard for many years.